Splatoon is a really fantastic, innovative online shooter. The colourful, squid-filled new franchise from Nintendo launched last week to some rave reviews (including our very own), but most seemed to echo a singular statement. The inky shooter was a little light on content – with only a single game mode and five maps peppering the online component. Something that’s already changed. Being new to the online shooter scene, Nintendo assumed it would be a good idea to lock Ranked Play and an alternate game mode behind a wall – until a certain number of players had reached level 10 in-game. That marker was passed last night, unleashing Splat Zones onto the servers for the first time. Similar to Turf War, Splat Zones tasks both teams with inking a singular portion of the map for an allocated time. The team who manages to hold these points for the longest wins – much like a messier version of King of the Hill. The mode will be playable on the now six map strong servers, with a new port side dock being added to the tiny collection. Port Mackerel will be a new zone to get all colourful over – and I do hope Nintendo have many more where it came from. Although Splatoon does a good job of masking it’s map inadequacies with a rotating system, it’s still disappointing to play such a small handful over and over again. It gets a bit better though. Joining Splat Zones and the new map is a brand new ink weapon, which players will be able to unlock through play. The N-Zap ’85 is a callback to the classic Zapper light gun from the SNES – which means I have no idea what it is because I was probably an infant back then. 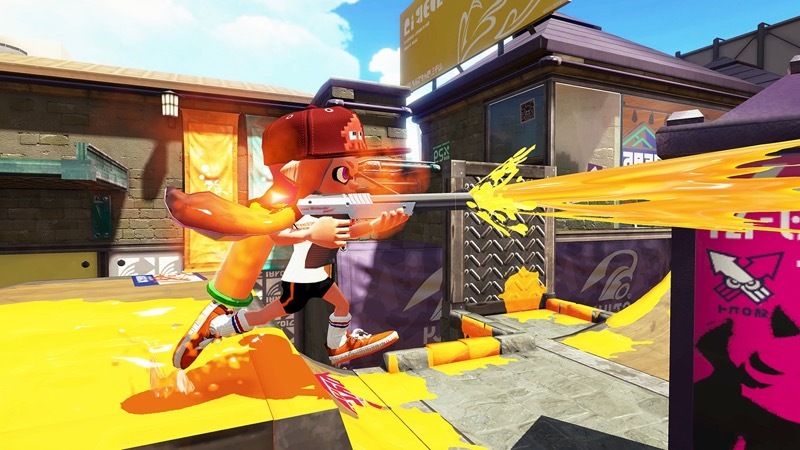 The new rapid-fire shooter comes with some good ink efficiency, and is paired with traditional Splat Bombs and the Echo-locator. Splatoon has a long list of post-launch content on the way, including a massive bundle in August. I still feel as though it probably should’ve all been ready for launch – but it’s a small blemish on an otherwise excellent shooter. In fact, it’s the most fun I’ve had online in quite some time. Previous article TMNT2 set pics reveal Shredder and pre-transformation Bebop and Rocksteady!